A culinary school provides hands on training and a simulated work-like environment to prepare students with the skills, techniques and professionalism to achieve life long career goals. The center offers courses in hotel operations and commercial cooking and catering. The school enjoys a fairly steady enrollment due to their work with government assistance programs to help provide veterans and the disabled with the skills to achieve and maintain a rewarding career. The success of the culinary school’s programs with their current government assistance clientele encouraged them to extend their program offerings for general enrollment. The center believed they could expand the impact of their programs by allowing more people the opportunity to learn and grow in the hospitality field. With a goal of increasing new student enrollment by 10 – 15 students per session, the school turned to Advance 360 because of our reputation for excellence, credibility of our expertise and data, and our team infrastructure to fully support and monitor their digital marketing efforts. The Advance 360 digital team worked closely with the client to identify the types of student prospects to target and the most relevant geographies to reach them. With two locations in the New York metropolitan area, the digital team focused on the 5 boroughs of New York and developed a multi-channel strategy to connect with the optimal audience including Search Engine Marketing (SEM), Facebook Lead Generation, and Display Remessaging. As the campaigns became established, the strategy was expanded to include Search Engine Optimization (SEO) and TrueView Video. SEM (paid search) campaign to drive leads and conversions. 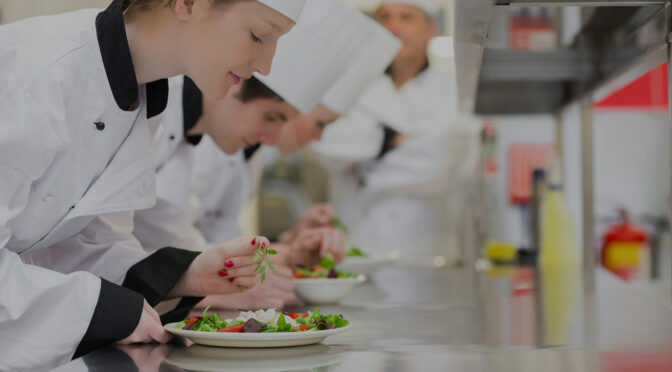 The Advance 360 search team developed an exhaustive list of relevant search terms/keywords to connect with potential students with an interest in hospitality, cooking and culinary education. Naturally, with the vast number of general consumer searches for cooking-related topics, the search team also implemented an extensive list of negative keywords such as bakery, demonstration and celebrity chef names, for example, to maximize the search budget and prevent budget loss due to incompatible appearances on search result pages. Facebook Lead Generation ads extend brand awareness with a call to action. Facebook lead ads were targeted to Veterans to inform them of the government assistance programs as well as recent high school students who are just starting to think about a career path, and people specifically interested in a culinary career. Lead generation ads delivered prospect information immediately to the client’s email and CRM. Display Remessaging ads reinforce the brand message and offer to recent website visitors. Among potential students that came to the school’s website via organic or paid marketing efforts to learn more about their programs, visitors that did not convert were served additional digital display messaging to keep the client top of mind and encourage conversion. SEO (organic search) expertise strengthens client’s website to improve organic rankings on search pages. The search team reviewed the client’s website and updated existing titles and descriptions with optimized content. They created a unique page for Veterans with fresh content and optimized images. The team also reworked and optimized their Google Business listings and helped to get their blog page functioning. TrueView Video can provide the most engaging level of messaging to connect with an audience. What better way to highlight the school’s facilities, meet faculty, glimpse classes in action and hear from satisfied graduates to make a lasting impression on prospective students? Search & Facebook campaigns drove a high number of actionable leads to the client. TrueView Video campaign garnered a 56% view rate which is over 2X the industry standard.